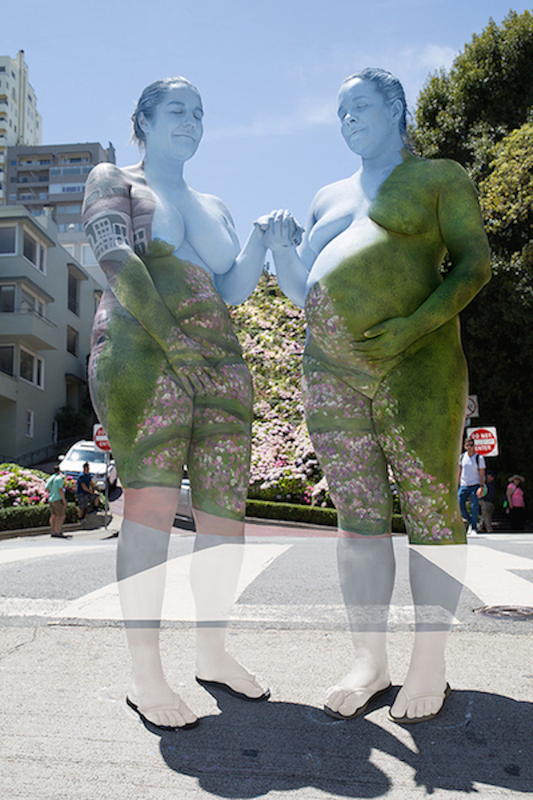 A set of trompe l'oeil body painting works by artist Trina Merry from her San Francisco Series: Visions in the Fog gives new meaning to the term "painted lady." As KQED reports, to make an entrance in her new city of New York (the artist also lives in San Francisco, hails from San Jose, and identifies herself as bi-coastal), Merry "decided to paint one model into the iconic New York City skyline. Just me, one model, my paints and camera, and the hope we don’t get arrested today,” says Merry. Here in San Francisco, Merry arranged her models in a nod to Botticelli, Raphael, Manet and Matisse. These artists knew well the power of the naked body — perhaps, Merry posits, better than their modern day counterparts.